Whether you’re shooting a basketball game from the sidelines or the great wildebeest migration in the Masai Mara, you’re going to want a camera with a lens that’s fast enough to catch all of the action. While some prefer the flexibility of an interchangeable-lens system with a large sensor, others dislike the bulk and weight of the gear involved. Fortunately for us all, technology is catching up to those of us who want a small camera with a large sensor and the ability to change lenses. Whatever your preference may be—below is a list of ten cameras recommended for sports, wildlife, and action photography for your adventures in 2016. 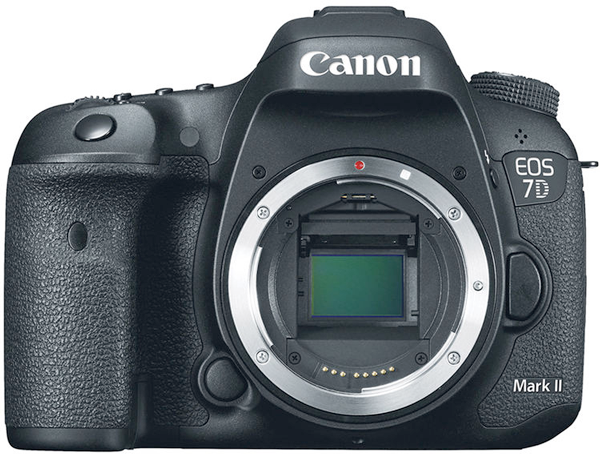 For the absolute latest flagship release, the new Canon EOS-1D X Mark II features a 20.2MP full-frame CMOS sensor, Dual DIGIC 6+ processors, and a 61-Point High Density Reticular Auto Focus II with 41 cross-type points and a center point sensitive to -3 EV. This durable magnesium-alloy body has been designed for the pro shooter, delivering 16 frames per second when working in live view, and 14 fps when working with the viewfinder, not to mention the ability to record up to 170 raw files in a single burst when using a CFast 2.0 memory card. An expanded sensitivity range from ISO 50-409600 allows for greater low-light performance. 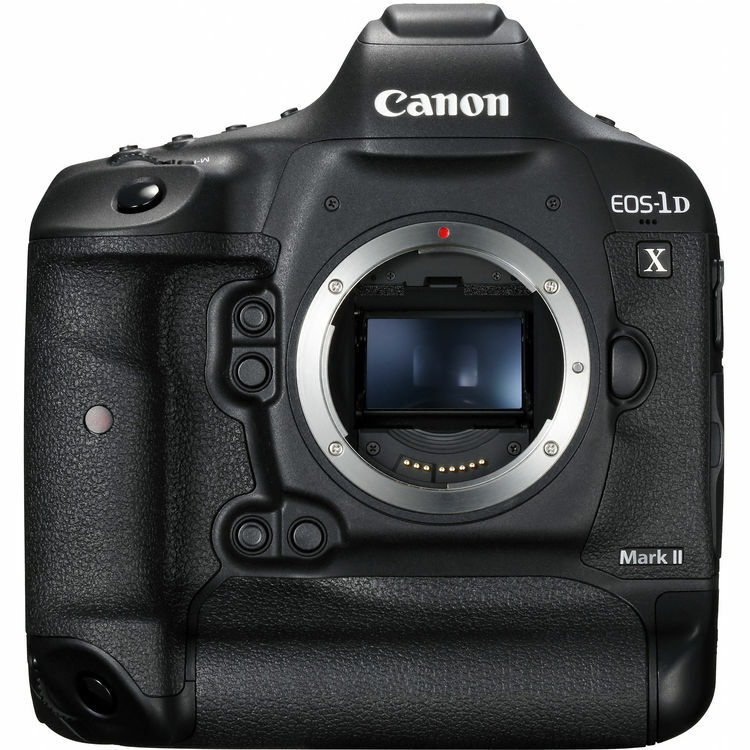 Furthermore, the weather- and dust-proof EOS-1D X Mark II supports DCI 4K-resolution video recording at up to 60 fps, along with Full HD 1080p shooting at 120 fps for slow-motion playback. A built-in GPS module allows for in-camera geo-tagging and auto time sync while Wi-Fi sharing and wireless remote control is supported when using the optional WFT-E8A Wireless File Transmitter. Another recent release, the Nikon D5 houses a 20.8MP FX-format CMOS sensor, an EXPEED 5 processor, and 153-point Multi-CAM 20K phase-detect auto focusing. Photographers wanting to capture a fast-paced sports game or animals in the wilderness running at top speeds will be delighted by the 14 fps maximum continuous frame rate with fixed focus and mirror lock-up. For those desiring full auto exposure and focusing, a slight drop to 12 fps is sure to capture the perfect action-packed moment with precise focusing. Nighttime wildlife feed times and night games won’t be as challenging to shoot with the native sensitivity range from ISO 100-102400 and the expanded range of ISO 50-3280000. Photographers who also work in video will be pleased with the D5’s 4K UHD video-recording capabilities. Wi-Fi connectivity is possible with the optional WT-6A transmitter. 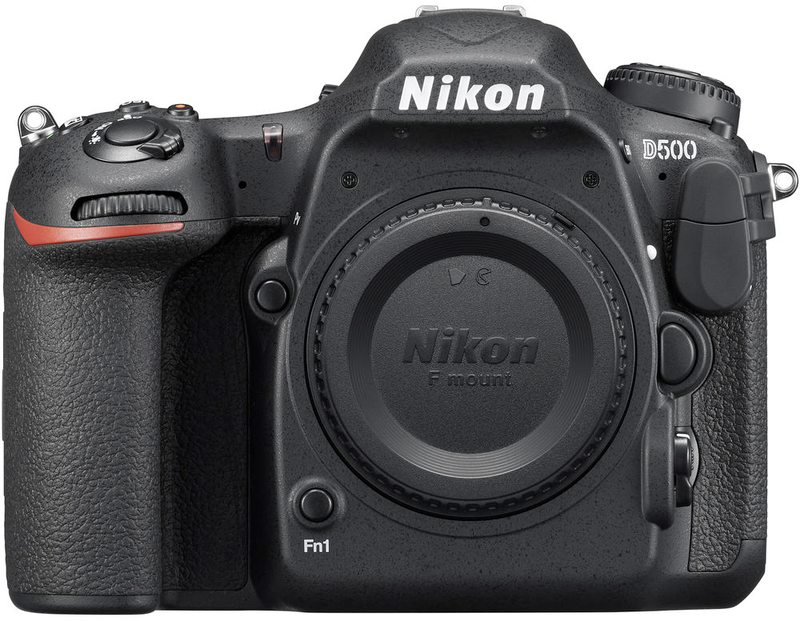 For flagship performance in a compact DX-format body, the Nikon D500 DSLR Camera is another recent release to the market. Featuring a 20.9MP DX-Format CMOS Sensor, it houses the same EXPEED 5 processor and 153-point Multi-CAM 20K phase-detect autofocusing as the D5 for significantly less of an investment. Sports and wildlife shooters alike will readily take advantage of the 10 fps continuous shooting rate for up to 200 frames in a single burst. The native sensitivity range from ISO 100-51200 with an expanded ISO 50-1640000 is able to handle tough lighting situations. The D500 also offers up to 4K UHD video recording at 30 fps. Multiple sharing options like the built-in SnapBridge Wi-Fi connectivity, Bluetooth Low Energy (BLE) technology, and Near Field Communication (NFC) are all supported to provide quick methods for connecting to your mobile device. Another APS-C offering, this time from Canon, is the Canon 7D Mark II, which features a 20.2MP APS-C CMOS sensor with dual DIGIC 6 image processors and a continuous shooting rate of 10 fps. This fast action capture relies heavily upon the 65-point all cross type phase-detection AF system that makes it a great choice for sports and wildlife photographers. The combination of dual image processors and CMOS sensor contribute to the native ISO range of 100-16000, which can be expanded to ISO 51200. For those working across platforms, Full HD 1080p video recording is supported at up to 60 fps and benefits from Dual Pixel CMOS AF for fast focusing during video and live view. 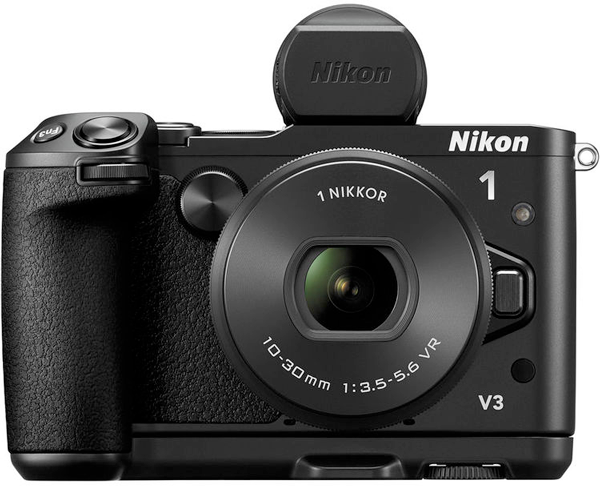 For a lot of speed in a compact mirrorless body, the Nikon 1 V3, available here with the 10-30mm kit lens, combines an 18.4MP 1" CMOS sensor and an EXPEED 4A image processor to achieve 20 frames per second with full-time autofocus capabilities. Once the focus position is fixed after the first frame is recorded, continuous shooting captures up to 60 fps—perfect when you’re close to the action. The intuitive Hybrid AF system combines both phase- and contrast-detection focusing methods to capture all of the action with extreme precision. In addition to the high-resolution still photographs, Full HD 1080p video recording is supported at 60 frames per second with a sensitivity of 12800 and full-time focusing for constant sharpness. While many photographers still wrinkle their noses at a tilting screen, it affords easier visibility from a variety of angles that would be otherwise impossible with a traditional viewfinder. For the traditionalist, an auxiliary electronic viewfinder is included. The camera’s built-in Wi-Fi enables you to quickly share photos immediately after recording them. For existing Nikon shooters looking for a compact camera solution, slip the FT-1 Mount Adapter onto the Nikon 1 V3 so you can work with all your favorite F-mount glass. Featuring a 24.35MP APS-C CMOS sensor, the Pentax K-3 II has a PRIME III image processor, optimized for high-speed shooting at 8.3 frames per second, and a competitive ISO range of 100-51200. Twenty-seven distinct phase-detection points include 25 cross-type for quickly and accurately pinpointing focus. Image quality and overall versatility is improved upon with a selectable anti-aliasing filter to gain higher resolution and sharpness or to protect against moiré. The sensor-shift design compensates for up to 4.5 stops of camera shake, aiding even the most experienced fast-action shooter, especially with longer focal lengths. Full HD 1080p video recording is supported in multiple frame rates along with time-lapse capture with the interval timer. 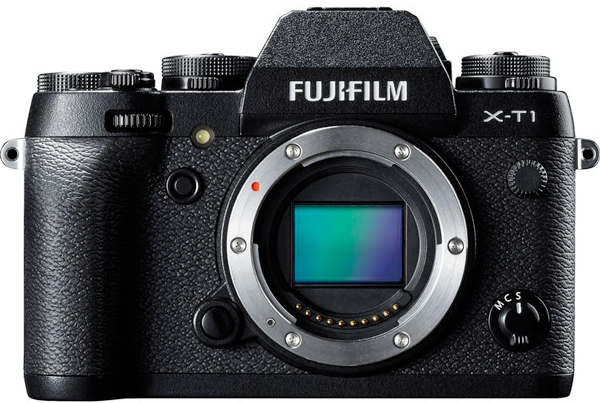 For those wanting to take advantage of Fujifilm’s history in traditional film-based photography, several Film Simulation modes mimic some of the classic film types in the compact Fujifilm X-T1, which offers a 16.3MP APS-C X-Trans CMOS II sensor and an EXR Processor II, both contributing to its top continuous shooting rate of 8 frames per second. The expandable ISO range, from ISO 100-51200 is equally competitive, as is its proprietary X-Trans sensor, which takes advantage of a randomized pixel array instead of the more commonly used resolution-reducing optical low-pass filter. 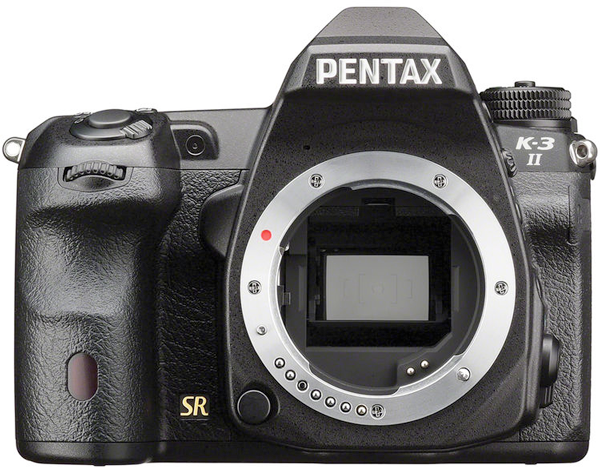 Digital Split Image and Focus Highlight Peaking enable fast and efficient manual focusing. Built-in wireless connectivity allows for instant sharing of photos and videos to your Android or iOS mobile device, as well as remote camera control and monitoring. 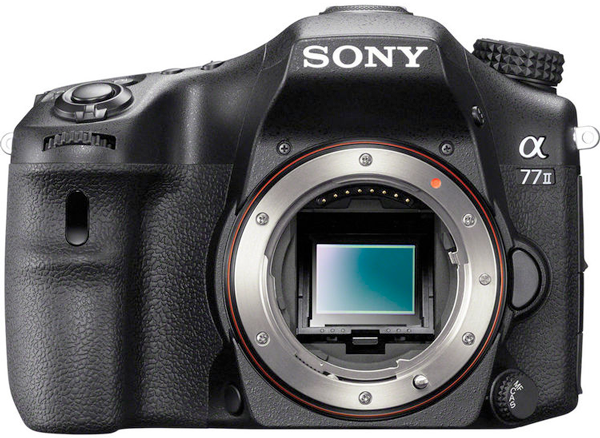 The Sony a77II features a 24.3MP APS-C Exmor CMOS sensor and a BIONZ X image processor that work together to produce continuous shooting at up to 12 fps for as many as 26 RAW frames. Translucent Mirror Technology enables the 79-point AF system with 15 cross-type points to work seamlessly while photographing in continuous shooting mode or while recording video and it enables full use of live view and the electronic viewfinder during shooting. Full HD 1080p video recording is supported at both 60 and 24 fps. Built-in Wi-Fi connectivity and NFC are both available without a complex setup. 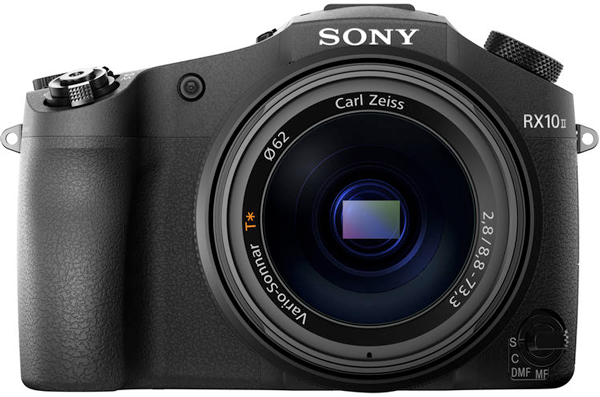 For a smaller and more compact Sony body, the 14.25 ounce Sony a6300 is an advanced mirrorless option featuring a redeveloped 24.2MP APS-C Exmor CMOS sensor and BIONZ X image processor that work simultaneously to produce continuous shooting up to 11 fps. A 425-point phase-detection system with a 169-area contrast detection system allows for High-density Tracking AF for increased accuracy when following moving subjects across the image frame. Due to the on-sensor design of the AF system, it also works when shooting UHD 4K video, which is possible at a high 100 Mbps for maximum quality. Built-in Wi-Fi connectivity and NFC are also supported in the a6300 for direct sharing online to social networking, via email, and to cloud storage sites. For those wanting everything (or as close to everything as technology will allow) in one package, the Sony RX10 Mark II offers a 20.2MP 1" Exmor RS BSI CMOS sensor with a Carl Zeiss 24-200mm f/2.8 lens. This all-in-one camera offers a flexible built-in zoom that eliminates the need to carry additional lenses. Its constant maximum aperture of f/2.8 and sensitivity range of ISO 100-12800 provides excellent low-light capabilities. The BIONZ X processor enables continuous shooting up to 14 fps and contributes to the camera’s precise and speedy autofocus, as well as UHD 4K video recording. Built-in Wi-Fi connectivity and NFC round out the RX10 Mark II for direct sharing, as does its moisture- and dust-resistant construction, a built-in pop-up flash, and the Sony Multi-interface shoe for connecting flashes, microphones, lights, monitors, and other accessories. While far from exhaustive, this list is meant to be a springboard into the pool of advanced, fast cameras 2016 has to offer for all of you sports and wildlife enthusiasts. As every photographer knows, cameras are only going to get smaller, faster, and more technologically advanced as the year goes on. what camera would you recommend for shooting car racing? 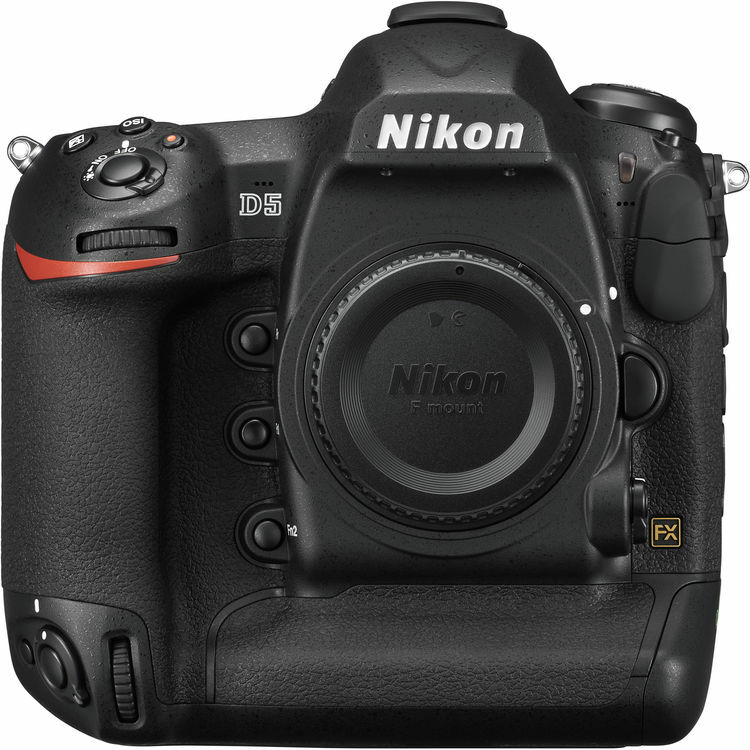 For your needs, I would consider the Nikon D500 DSLR Camera (Body Only) B&H # NID500, which allows for a continuous shooting rate up to 10 FPS and offers a 153 point AF system. You can easily pair it with the Nikon AF-S NIKKOR 70-200mm f/2.8E FL ED VR Lens B&H # NI7020028E and gain an equivalent focal length of 105-300mm. This is due in part to the crop factor of 1.5X on the DX sensor and that full frame lens. While which camera is “best” is subjective as the best would be personal preference, the DSLR cameras I would recommend as great options for sports photography would be the Canon EOS 7D Mark II DSLR Camera Body with W-E1 Wi-Fi Adapter, B&H # CAE7DM2, or the Nikon D500 DSLR Camera (Body Only), B&H # NID500. 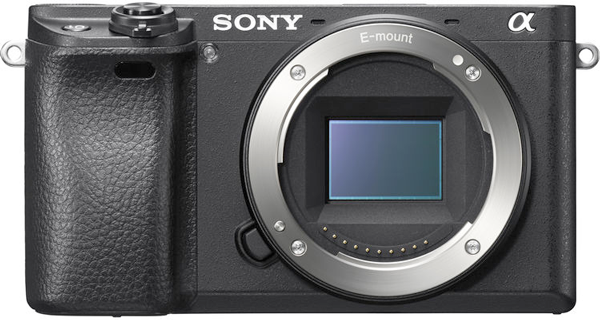 If you are looking for mirrorless cameras, the Sony Alpha a7 III Mirrorless Digital Camera (Body Only), B&H # SOA73, and the Panasonic Lumix DC-G9 Mirrorless Micro Four Thirds Digital Camera (Body Only), B&H # PADCG9, would be good options. For lenses for the above cameras, a 70-200mm f/2.8 lens would be a good option for sports photography usage needs. The Canon EF 70-200mm f/2.8L IS II USM Lens, B&H # CA7020028LIQ, the Nikon AF-S NIKKOR 70-200mm f/2.8E FL ED VR Lens, B&H # NI7020028E, the Sony FE 70-200mm f/2.8 GM OSS Lens, B&H # SO7020028GM, the Panasonic Lumix G X Vario 35-100mm f/2.8 II POWER O.I.S. Lens, B&H # PA3510028A, or the Olympus M.Zuiko Digital ED 40-150mm f/2.8 PRO Lens, B&H # OL4015028B, would all be comparable options for use with the aforementioned cameras. I want the best VIDEO CAMERA for sports, wildlife and action. As such, I need the BEST, fastest, most accurate autofocus system available. I was hoping to spend around $3,000, but can go up to about $5,000 if that makes a huge difference. Canon Dual Pixel CMOS AF is one of the best auto focus systems available. The XF405 is a 4K camcorder with a 15x zoom lens, 1" sensor and Dual Pixel CMOS AF. It is right in your budget as well, it is a great option. If you will be shooting in bright lighting, the Canon EOS Rebel T7i DSLR Camera with 18-55mm and 55-250mm Lenses Kit, B&H # CAEDRT7I1825, would be a good option for your usage needs. It is a two lens kit; a standard zoom lens and a longer telephoto zoom lens. If you are looking for a higher quality telephoto lens, the Tamron 70-200mm f/2.8 Di LD (IF) Macro AF Lens for Canon EOS DSLR Cameras, B&H # TA7020028MC, would be a good option for your usage needs. If you need a lens with longer zoom reach, the Sigma 150-600mm f/5-6.3 DG OS HSM Contemporary Lens for Canon EF, B&H # SI1506005CC, would be recommended for your usage needs. While both cameras have the same resolution and capable of shooting 10 FPS in continuous mode, the D500 would stand out based on its higher number of AF points and its low light performance. I am looking to purchase a new camera, my passion is to catch things in motion. I take a lot of pictures of whales and dolphins on the sparkling ocean waters. I also like to take pictures of birds, wild life and even the grand kids. I like close up shot of birds and flowers. What is your recomendations for me?? Thank you in advance. That is a little steeper then i thought it would be after adding all the lenses. Do you have a second recommendation? If you are looking for a more economical option, the Nikon D3500 DSLR Camera with 18-55mm and 70-300mm Lenses, B&H # NID35002LK, would be a kit that includes a standard lens and a telephoto lens. While not as long as the lenses I listed in my previous reply, it should still be compatible for your planned usage needs. Hello I am a beginner. I am interested in being able to capture my dog in action, close and far (100ft) as well as capture subjects in action at sporting events (lifeguard competitions in ocean) (up to 500ft) and also nature shots. A good quality automatic would be great or something not too difficult to operate at a mid range price. Thanks for your help. I apologize if someone has already answered this question. I currently have a Lumix FZ 70 and I love the incredible focal range -- and the zoom (20-1200), but the auto focus is quite slow (unless I'm not using the right settings...?) I'm wondering if there is something with as great a zoom but faster auto focus, for taking photos of wildlife - in particular on an upcoming trip to Costa Rica. I'd like to avoid changing lenses, in part because of the added weight. Thanks! While you state you do not have thousands of dollars (which I totally understand), a good setup I would recommend would be the Canon EOS 77D DSLR Camera with 18-55mm Lens, B&H # CAE77D1855, along with the Sigma 100-400mm f/5-6.3 DG OS HSM Contemporary Lens for Canon EF, B&H # SI100400C. This is the best “mid-level” recommendation I have that would be slightly above $1,000.00, but not in the multiple thousand-dollar price range. A lesser option would be the Canon EOS Rebel T6i DSLR Camera with 18-135mm and 75-300mm Lenses Kit, B&H # CAEDRT6I753K. If you think she would be okay with a small point-and-shoot camera that has a good zoom and would still work for her usage needs, the Sony Cyber-shot DSC-RX10 Digital Camera with Free Accessory Kit, B&H # SODSCRX10BK, and the Panasonic Lumix DMC-FZ1000 Digital Camera, B&H # PADMCFZ1000B, would both be good options for your usage needs and can capture awesome images. So Happy I found this article. My old Cannon Rebel 40D died. Good camera but slow and I need to upgrade. I am very interested in mirrorless and especially like the lighter weight. I will primarily be taking pictures of my daughters playing soccer and cheerleading. I also coach one of their teams and take team pictures and action shots of the team. I was looking at the Sony a6500 and Cannon M50. I am also not against DSLR (just heavier) but I did love my rebel. For DSLR I was looking to maybe go Nikon 5600 or Cannon SL2. My old cannon 40D took very blurry action shots and I really want some great action shots of cheer and soccer. I know I need to get a lens to accompany any new camera to be able to zoom in on the fields. For me I really want to take quick great shots. I read in your article about burst rate and fps. But the more I read the more I am torn on all of this. Do you have a recommendation? It seems from reading a reply from you below the Sony a6500 really is a beast. Would that be my best bet to take action shots that look great but also serve as a great all around camera or would one of the other ones I listed above be better option for me? I am not a pro camera guy, just a family guy who wants to save these memories. Thanks. The last camera I owned was $500 -600 with a 14x optical zoom. Canon Power Shot SX210. I loved it. It has officially died. I know and am willing to invest a bit more... I have two children very active in sports, Basketball, Competitive High School Dance Team and LaCrosse. I am looking for a new camera. I take a ton of photos. Infact my phone shut down when I had over 30000 photos on it :) . I try to get pics of other kids on the team, not just my own. I'd like something thats easy to use, although I am not afraid of learning and would go to a few classes even. I would like to learn to do more and use for still and action shots. Hoping to take their own senior pics in 3 years. And I also love pictures of nature, various lighting and sky elements and water. I appreciate any suggestions that you can offer. If you are looking for a DSLR camera that would have more manual features and will work as you described above, the Canon EOS Rebel T7i DSLR Camera with 18-55mm and 55-250mm Lenses Kit, B&H # CAEDRT7I1825, would work for your usage needs. There are no lens designed for DSLR cameras that would have the same amount of zoom of a point-and-shoot camera, but the cameras have much larger sensor and would have much better low-light performance and would have the ability to capture much better images. You can get lenses that are brighter and sharper and would work for learning photography and for capturing senior pics, landscape/nature images, though you may need a few accessories to capture images of lightning (you can get images of lightning without a lightning shutter trigger, but it does make it easier). This would be a good option for your planned usage. I would recommend the Nikon D7500 for your needs, which is user friendly and which allows for 8 FPS in continuous mode. I am wanting to upgrade from what I currently have, but, I am unsure of what to get. I am not a professional, but do good work for a beginner. I am working my way up where I would like to become a professional photographer some day. You may want to consider the Nikon D7500 DSLR Camera with 18-300mm Lens Kit B&H # NID750018300 in this case. It can shoot up to 8 frames per second in continuous mode and a 51 point AF system. The Nikon AF-S 18-300mm lens would be fine as an all around zoom for you needs as well. Hello! Where does the Nikon D850 fit in this list? Is it's AF tracking suited for Wildlife action & sports? Thank you for your question. At this time this article was published, the D850 was not yet released. However, its AF tracking would definitely be suitable for someone who's looking to shoot wildlife or sports. I want to capture very long videos( e.g. whole basketball or football game), in 1-8 takes depending on how much can battery can hold in at least 720p. So my question would be, is there any camera that suits this need? I would mainly look on used market to find something cheaper than 500$ price point. And last would be maybe silly question, if there isn't capable battery is there camera plugged into wall socket for these needs? Thanks in advance and sorry for spelling mistakes! The Panasonic HC-V770K is a great option to consider. It is an affordable camcorder with a 20x Zoom and 1/2.3" Back-Illuminated Sensor. It will be able to record for as long as the memory card allows and you can connect it to wall power with the included AC Adapter. Can somehow this camcorder parry it? The R800 is a nice option if you are on a limited budget. It has a much smaller sensor at 1/4.85" compared to 1/2.3" on the V770K though. The Panasonic will provide you with a superior performance for low light and overall image. But for the price the R800 is very nice. Hi someone out there have knowledge about camera. I m a proud grandmother with 3 grandkids playing soccer and basketball, i m using iPhone 7+ now to capture our memories. I m a slow learner, therefore I would like to know is there a camera out there can just take an action photograph and can zoom to the object . Looking for a camera to shoot video of sports events. Need something that captures movement fluidly, keeps as close to an infinite focus as possible, has easy zoom and can be shoulder mounted. I used to shoot sports professionally for various networks using a Sony beta cam (that should tell you how long ago) and it was great for infinite focus and ease of zoom. Unfortunately, I don't have that kind of budget. Looking for something in the $3-5k range, preferably compatible with canon lenses. Thanks! For a camera that will work for your needs and in that budget you really would want to look at choices that have a lens built in to the camcorder. The Canon XF400 would be a great place to start. Dual-Pixel CMOS Autofocus is great for capturing fast moving sports, it has a 15x zoom and a 1" Sensor. It is also UHD 4K, so you'd be up to date with current technology. We have great options to turn it in to a shoulder mount system as well. My budget is limited, so the cheapest options which can help me have good results and is very simple to use (basically point and shoot or something very simple) would be greatly appreciated! Many thanks again for all your kind advice! I need a light weight body and lens for basketball and baseball. I have a Nikon d200 now with a sigma 70-300. I'm not wanting to put much money in body but lens 700-800. If that's possible. What do you suggest? Unfortunately, there are very few telephoto zoom lenses that zoom out to 700-800mm, and the Sigma 300-800mm f/5.6 EX DG APO IF HSM Autofocus Lens for Nikon AF-D, B&H # SI300800DGNA, which is the only zoom lens we have in this range, is not lightweight. It is a 12.91 lb (5.86 kg) lens that is 21.3 inches (54.10 cm) long and costs $7,999.00. The next options I would recommend would be either the Tamron SP 150-600mm f/5-6.3 Di VC USD Lens for Nikon, B&H # TA1506005N, which is 4.30 lbs (1.95 kg) and 10.15 inches (25.78 cm) long, or the Sigma 100-400mm f/5-6.3 DG OS HSM Contemporary Lens for Nikon F, B&H # SI100400N, which is 2.55 lbs (1.16 kg) and 7.18 inches (18.23 cm) long. For indoor sports, all of these options may require you to use a higher ISO, which may result in noisy images with the older Nikon D200 DSLR camera. Due to its age, the technology in the Nikon D200 DSLR camera is over 13 years old. While they may be lower in Nikon’s current lineup compared to the mid-level position of the Nikon D200 on its release, I would actually recommend both the Nikon D3400 DSLR Camera with 18-55mm Lens (Black), B&H # NID34001855B, or the Nikon D5600 DSLR Camera (Body Only), B&H # NID5600B, over your current camera for your planned usage. All three of the above cameras have the same continuous burst rate speed, which is 5 frames per second, but the two newer cameras can shoot up to 100 JPEG images at that speed before slowing down to write images to the memory card, while the Nikon D200 can only sustatin that speed for up to 31 JPEG images. The two newer cameras also have higer image resolution at 24.2 megapixels, and more importantly, they have better dynamic range, color depth, and low-light performance with less noise at higher ISO settings for overall better image quality compared to the Nikon D200 DSLR camera. They also have better battery performance for over 2.5x the number of images captured per charge. Also, they are both smaller and lighter in weight compared to the Nikon D200 DSLR camera. If you really need the amount of zoom you list and you want a smaller camera, while it would not be a DSLR camera and would have a smaller sensor, I would recommend considering the Nikon COOLPIX P1000 Digital Camera, B&H # NICPP1000, for your usage needs. It has a burst rate of 7 frames per second, and has a built-in lens with an optical zoom range of 24-3000mm f/2.8-8, has 16 megapixels, and built-in image stabilization. I am currently in the market for a camera but have no idea where to start on purchasing the right one. I live on a farm and enjoy photographing my animals. This can be difficult at times as they are ALWAYS moving and sometimes at fast speeds . At times, it is hard to get as close as I need to be to get a shot that comes out clear. I need something that is light weight and can do numerous frames per second. I am a beginner photographer but find myself taking pictures daily , so its time to invest. The ole iphone just is not producing what I am looking for. What cameras would you suggest? If you are looking for a small camera with which you plan to photograph fast-moving animals, I would recommend the Sony Alpha a6500 Mirrorless Digital Camera, or the previous model, the Sony Alpha a6300 Mirrorless Digital Camera. Both cameras are small and lightweight, and have some of the fastest autofocusing on the market. Both cameras shoot at up to 11 frames per second in burst mode, and they have decent low-light and higher ISO performance for an APS-C sensor camera, which will allow you to use a higher ISO setting, which will allow you to shoot at a faster shutter speed to assist in freezing movement. The Sony Alpha a6500 Mirrorless Digital Camera with 18-135mm Lens, B&H # SOA6500KB, or the Sony Alpha a6300 Mirrorless Digital Camera with 16-50mm and 55-210mm Lenses Kit (Black), B&H # SOA6300BK55K, would be good options for your planned usage needs. Both cameras are similar, but the main difference between the two cameras is the a6500 is the newer of the two cameras and it has in-camera image stabilization, so all lenses used on the camera would benefit from in-camera stabilization when hand-holding the camera. It also has a LCD touchscreen, has Bluetooth so the wireless connectivity is easy between your camera and smartphone/tablet, and the camera has a larger buffer so when you are shooting burst images, you can shoot longer before the camera slows down to write images from the camera to your memory card.